Earlier this year I was given the opportunity to check out the brand new 3rd generation Blur from Santa Cruz Bicycles. 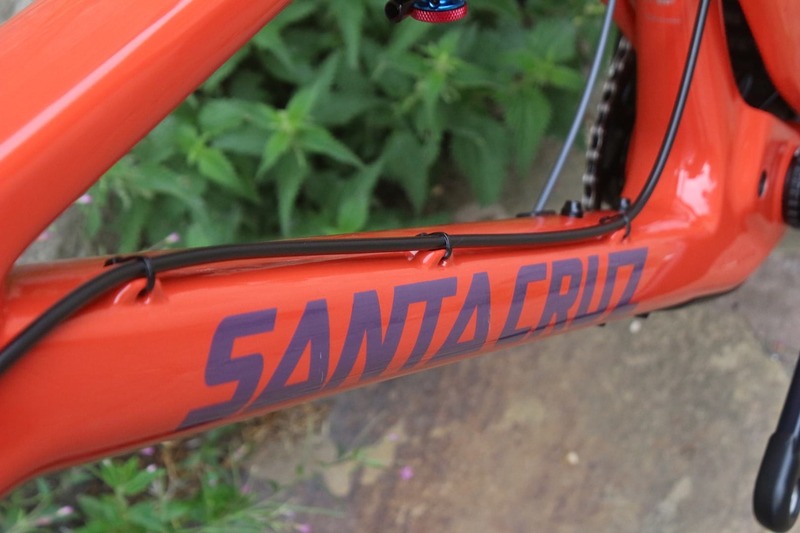 Following a 5-year hiatus, the Blur has returned to the Santa Cruz lineup for 2018 as a thoroughbred XC race whip, plugging a gap between the Highball and the Tallboy. 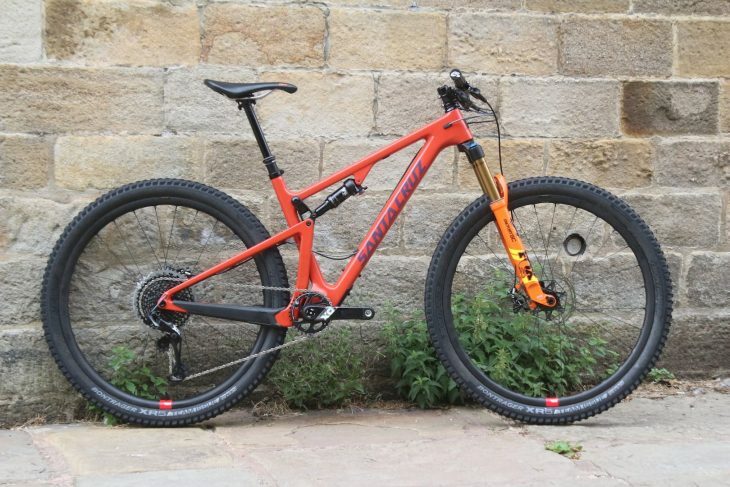 With low weight and speed in mind, the new Blur is equipped with 29in wheels, 100mm travel front and rear, and an all-new carbon fibre frame that Santa Cruz says is the lightest full susser it has ever produced. For the launch, I travelled over to California to eat some delicious burritos and drink some fancy West Coast IPAs. While I was there, I also swung a leg over both the new Blur and Highball on some fast and dusty singletrack around Santa Cruz headquarters. I was impressed with how light and efficient the new Blur felt, but was even more impressed with just how much fun it was on the descents (you can read my first ride review here). Since then, I’ve been keen to get one of the new Blurs into the office for a longer term test. 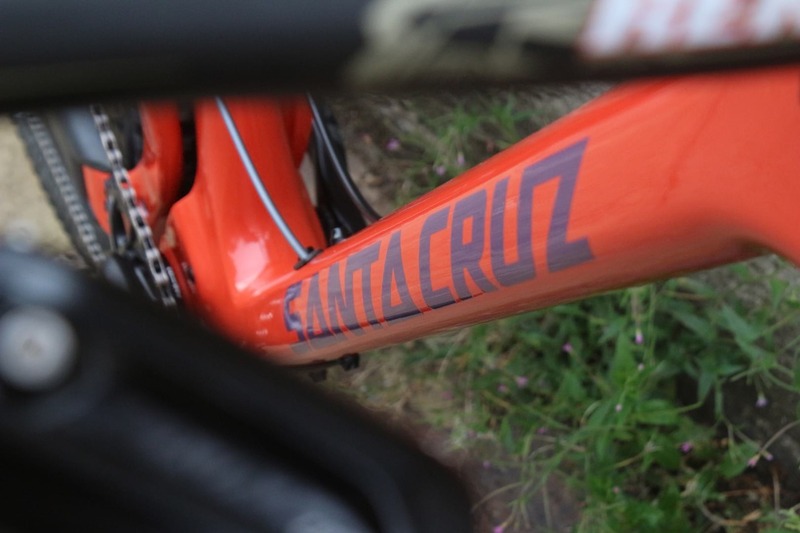 So we got on the blower to the folks at Santa Cruz, and put in a request for a Blur frameset to build up as a longterm test bike. The frameset arrived at Singletrack Towers a few weeks ago, and since then we’ve received a few more pieces to the puzzle including a SRAM 1×12 drivetrain, a Fox 34 fork, a Hope headset, and a Race Face dropper post. I wanted to build the bike with the Reserve 27 wheelset I helped assemble at the Santa Cruz factory during the Blurball launch, and I was also keen to try out the bike with a 120mm travel fork, since the frame will take one. 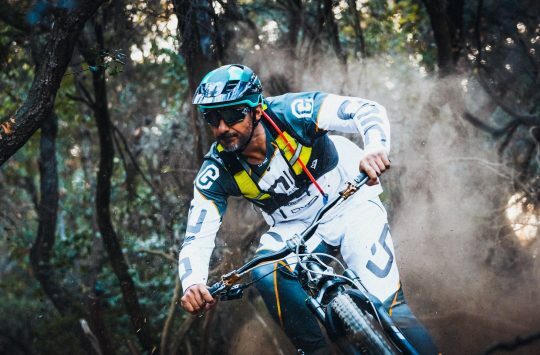 Though the Blur is meant to be a lightweight XC full suss race bike, I’m interested to see what the handling will be like with a bigger fork, some wider tyres and a more trail-oriented cockpit. The broadcast ended up as two videos, after the first one cut out for some reason. I managed to get everything online again for the last bit of the build before I sacked it off to go home for dinner. I wasn’t able to complete the build entirely, as I still needed to trim the steerer tube and install the gear and dropper post cable, so I went back to the office the next day to finish it off. Now, if you want to read the full specifications of the build, I’ve listed all that down the bottom of the page. 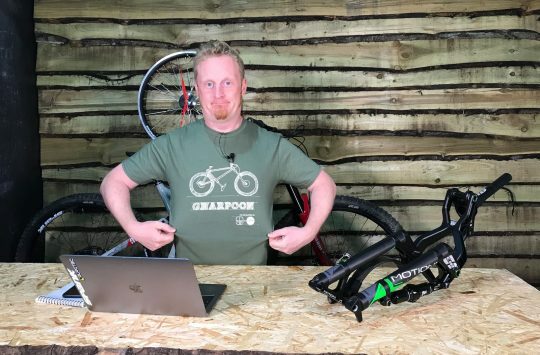 Right now though, I’m going to take you through some of the key elements of the complete bike, along with a photo gallery to show off some details on both the frame and the components used for the build. The heart of the bike is of course the Blur CC frameset. Using a carbon fibre mainframe and swingarm, the Blur frame is available in two different grades: CC and C. The CC is the lighter of the two, and this is what you get if you buy a standalone frameset, or if you get one of the higher-end build options. 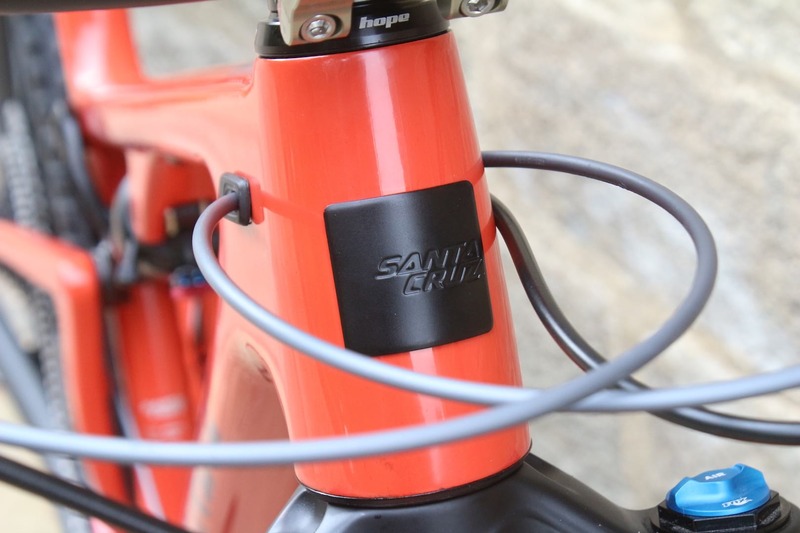 The lower-spec’d complete bikes come with the cheaper C frameset. As of right now, Santa Cruz won’t be offering the Blur in an alloy version. There’s 100mm of rear suspension travel delivered by the VPP dual-link platform, and the Blur is designed to run 100-120mm fork up front. You can only fit in 29in wheels (27.5+ wheels aren’t recommended) and there’s clearance for up to a 2.35in rear tyre. 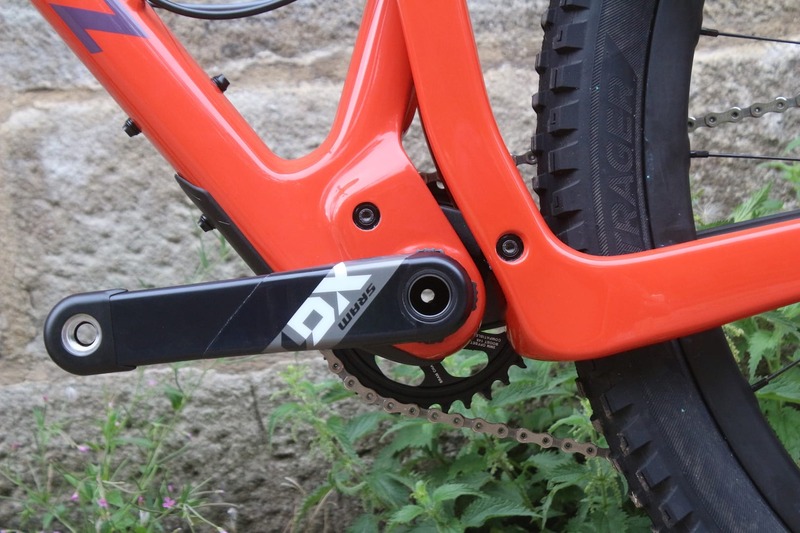 With the rear axle and shock, our Medium-sized test frame came in at 2.25kg (5.58lb). Don’t like the burnt mandarin colour? The Blur CC is also available in Matte Black. Up front is a 120mm travel Fox 34 SC fork. New for the 2019 model year, the 34 Step-Cast is a lighter version of the Fox 34 Float fork. 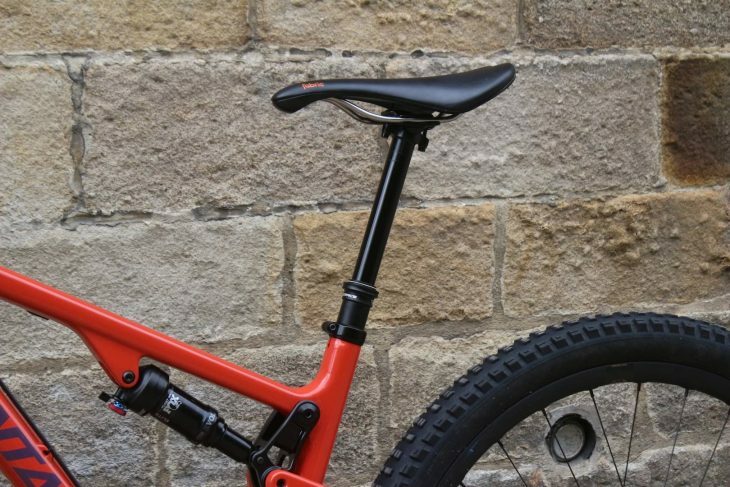 It still has 34mm diameter stanchions, but it draws on similar construction techniques to the 32 Step-Cast fork, with slimmer magnesium lowers and shorter stanchions that are optimised around 120mm of travel specifically. 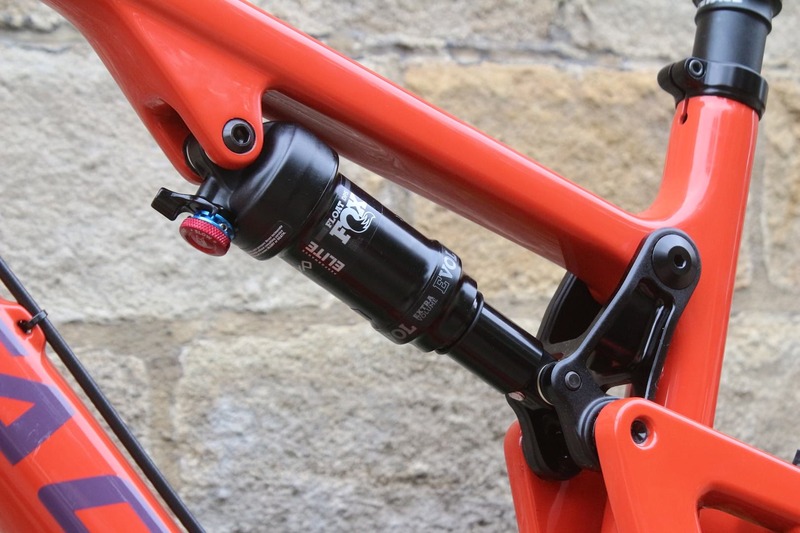 Along with a shortened air spring and damper cartridge, the 34 Step-Cast drops some 200g off a regular 34 Float fork, bringing the weight down to 1650g (confirmed) with a full-length steerer. I tested the 34 Step-Cast fork when it first launched in April, but we’ve since received a second one with a shorter 44mm offset. I’ll be doing some fork swapping on the Blur as part of a separate feature on fork offset and the effect it has on handling on the Blur. Santa Cruz Reserve rims wrapped with tubeless Bontrager tyres. I actually built this wheelset a few months ago at the Santa Cruz factory. Well, I did get a bit of help in the process. I’ve been waiting for the right bike to test them on, and figured the Blur would be an ideal wagon to do so. 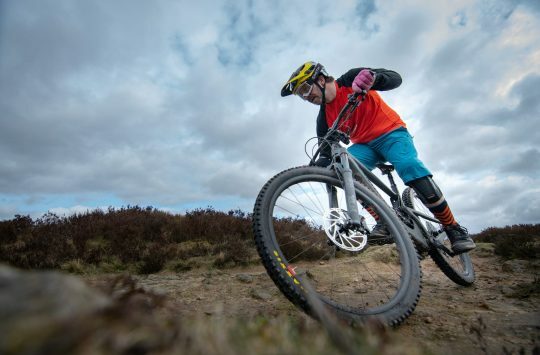 The wheelset is built with DT Swiss hubs and spokes, and features Santa Cruz’ new Reserve 27 carbon fibre rims. 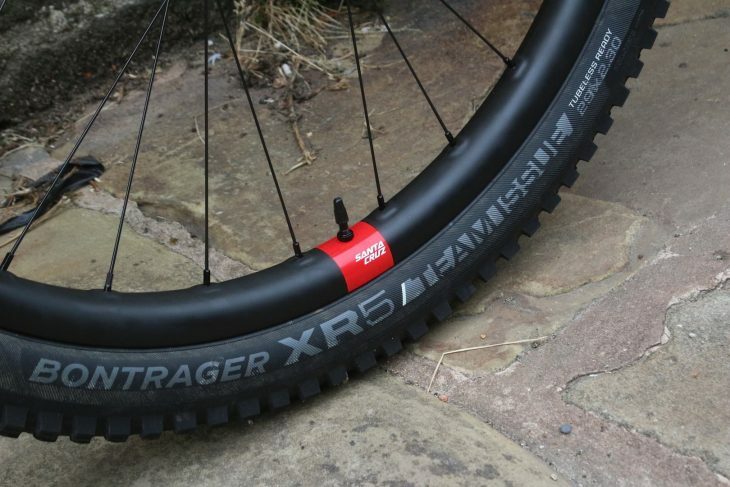 These measure 27mm wide internally, making them a good match with the 2.3in wide Bontrager XR5 tyres. Confirmed weight for the wheelset (with tubeless valves and tape) is 1738g. So not superlight, but good for a tough trail wheelset. 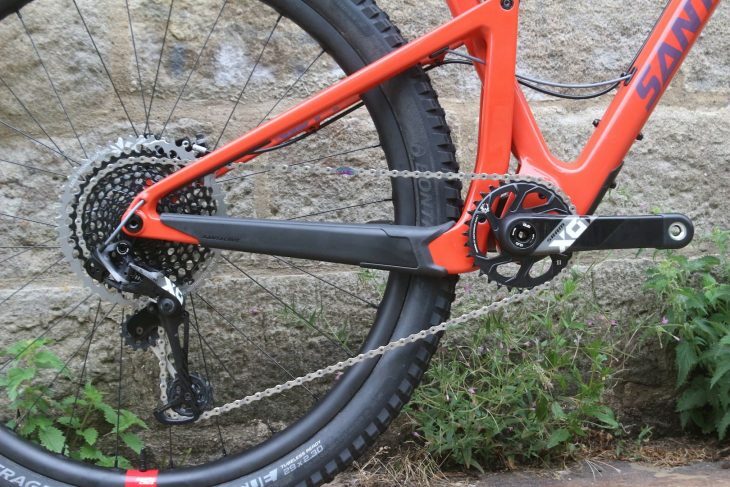 The Blur is 1x specific, so we went with a 1×12 Eagle drivetrain from SRAM. Arriving to us as an ‘X01-in-a-box’ package, the 1×12 X01 drivetrain isn’t exactly new, but it’s a good match for the Santa Cruz Blur frame, which is 1x specific. With the frame free of any mounts for a front derailleur, Santa Cruz has built the near-symmetrical swingarm on the Blur with double uprights to increase back-end stiffness. Rear centre length isn’t super short at 432mm, and tyre clearance isn’t huge, but a lot of the space around the chainring area has been taken up by the beefy carbon fibre frame. To match the new DUB cranks, there’s a threaded DUB bottom bracket. 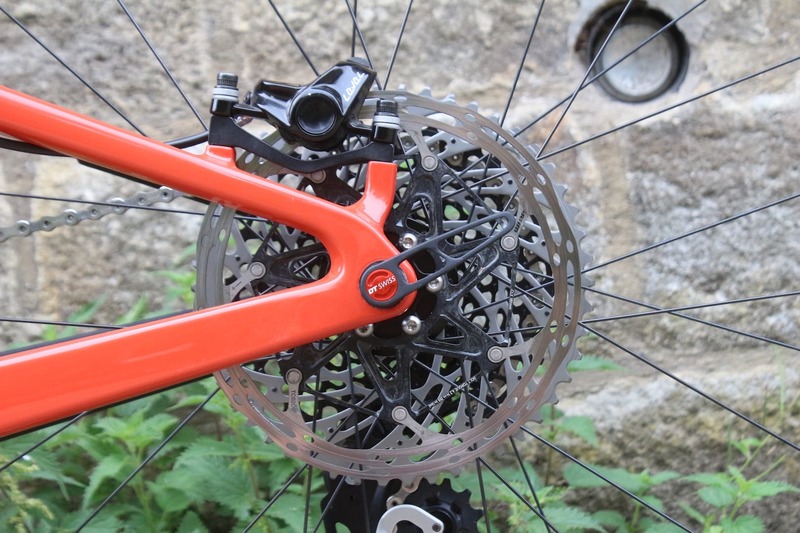 I’ve gone for a 32t chainring to match the 10-50t 12-speed cassette, and because the new X01 cranks feature a DUB crank spindle, there’s a matching DUB bottom bracket to go with it. 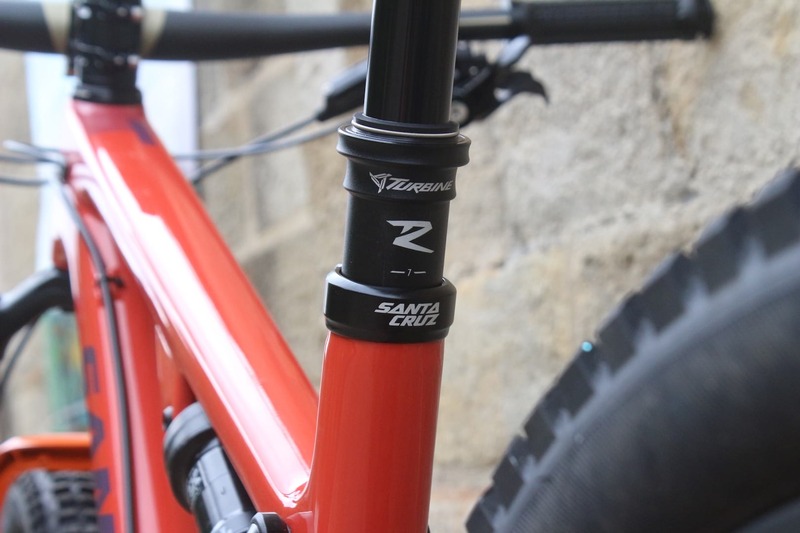 Santa Cruz still builds its carbon fibre frames with an alloy bottom bracket shell bonded in, and that means you run a threaded bottom bracket. I’ve fitted a couple of SRAM DUB bottom brackets already, and everything fits together nice and neatly. 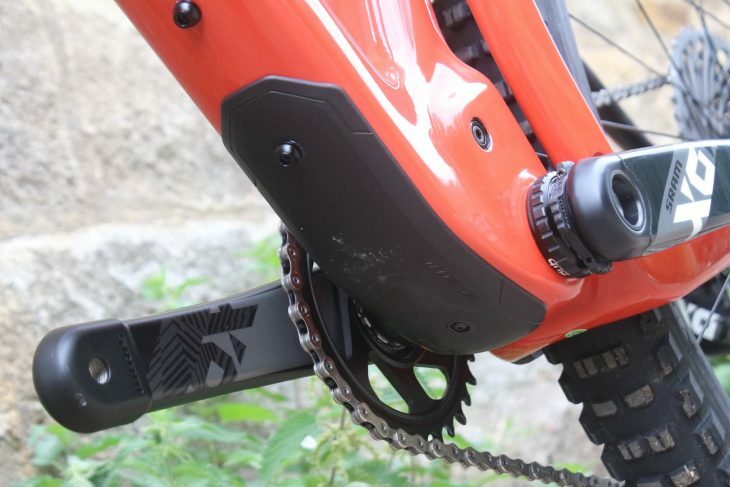 A threaded collar on the non-drive crank provides bearing preload for tuning out any play in the cranks. Like the fork, wheels and tyres, the cockpit for our test bike is a little burlier than what a stock Blur would come with. 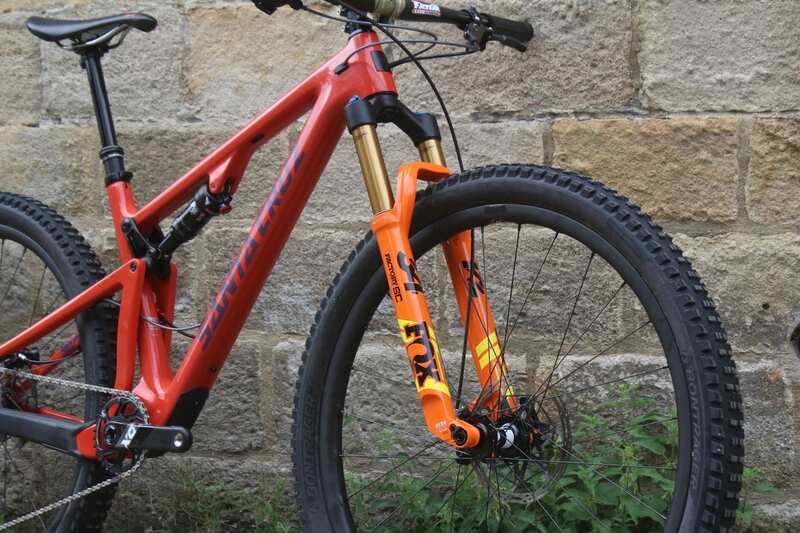 For this build I’ve gone for a 760mm wide Renthal Fatbar Lite Carbon, which weighs in at 190g. It’s the lowest 10mm rise option, with the goal of keeping the grips down low given the longer travel fork. And a 50mm long stem to go with it. 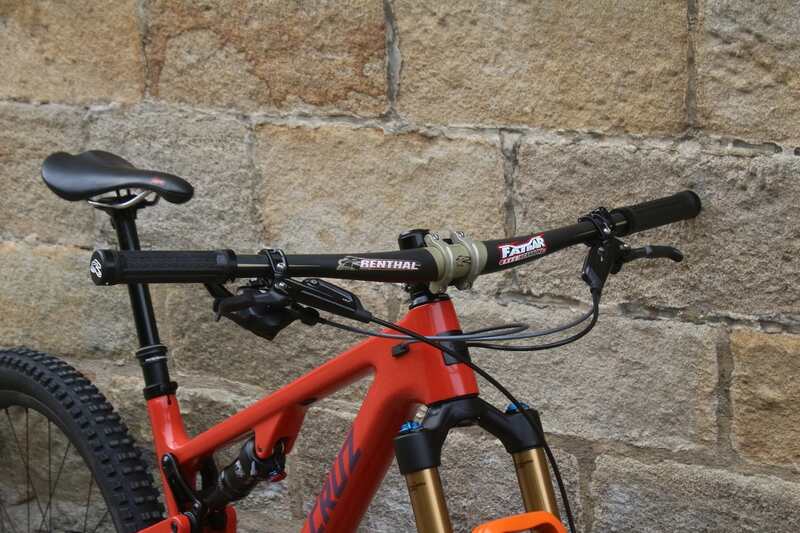 To match the carbon handlebar and its 35mm diameter, I’ve spec’d a Renthal Apex stem. This guy weighs in at 133g for the 50mm length option. Again, this is a bit shorter than what Santa Cruz specs on the complete builds, which feature a 70mm long stem for the M-XL frame sizes, and 60mm for the Small. 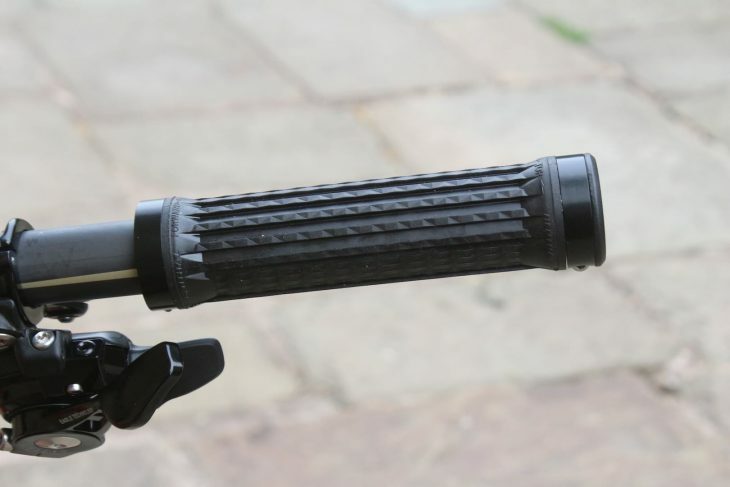 If you like soft and sticky grips, check out these Ultra-Tacky grips from Renthal. Renthal kindly sent us a set of lock-on grips to complete the cockpit. These feature dual locking clamps and an ultra-tacky rubber compound that is apparently made of gecko feet. 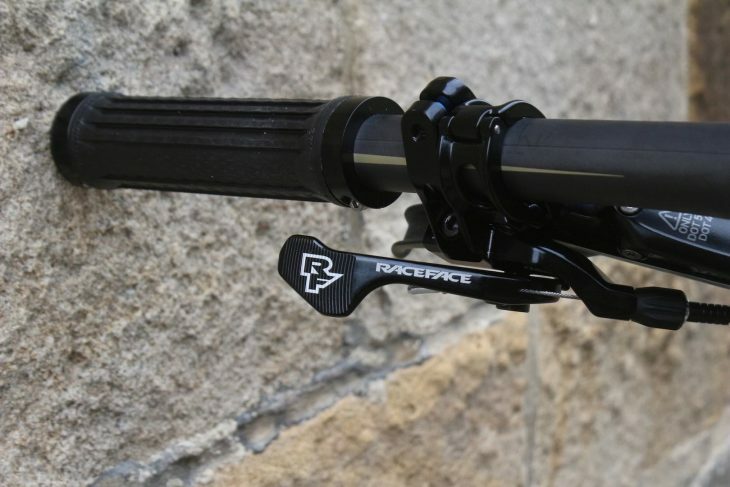 150mm travel dropper from Race Face. 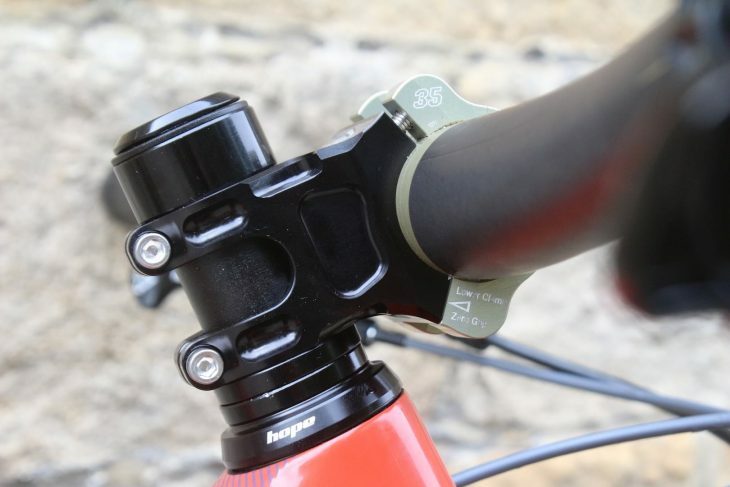 The Blur I rode back at the launch came equipped with a KS LEV Integra dropper post rather than the rigid Syntace P6 Hi-Flex seatpost that the bikes come with as stock. Unless you’re an absolute weight weenie, a dropper post is a no-brainer upgrade for the Blur, which features a 31.6mm diameter seat tube and internal routing. For this bike, I went with a longer 150mm travel Race Face Turbine R post, which is basically a rebadged Fox Transfer. That’s no bad thing though – the Transfer is one of my favourite droppers going. Confirmed weight for the Turbine R dropper on its own (without cable or remote) is 589g. You need to buy the Race Face Turbine dropper post lever separately to the post. 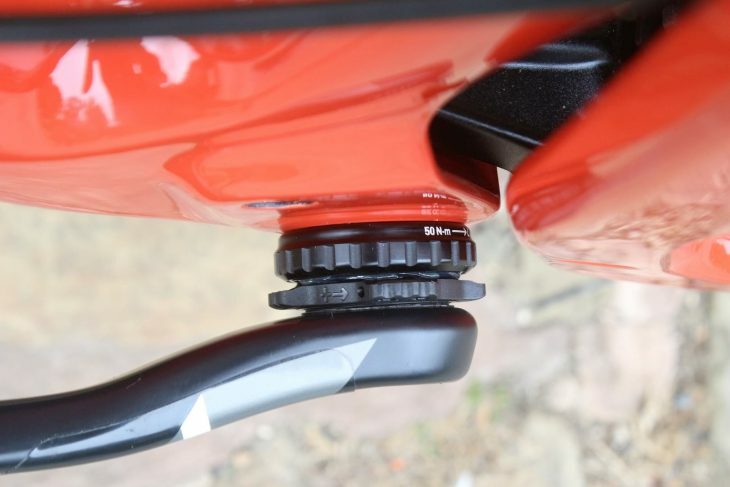 Like the Fox Transfer, the Turbine R also comes on its own, which means you have to buy the lever separately. You can get a Universal lever, which will work alongside a front shifter, or you can get this one, which is specific to 1x drivetrains. 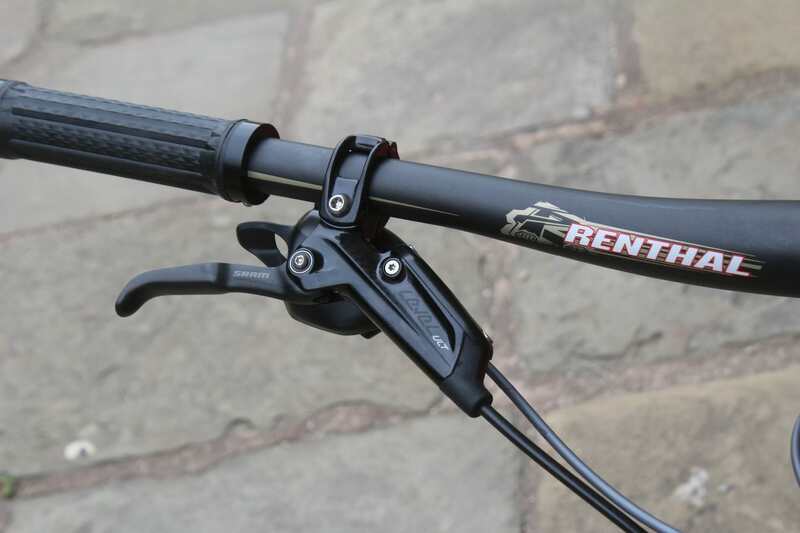 It isn’t cheap at £74.95, though it’s actually similarly priced to the Fox Transfer levers. Compared to Fox’s versions, this one has a much larger paddle, which sits underneath the left hand brake lever. Nice to see a proper head badge! Our test frame is the higher-end Blur CC option. A cheaper Blur C frame is also available with cheaper builds. 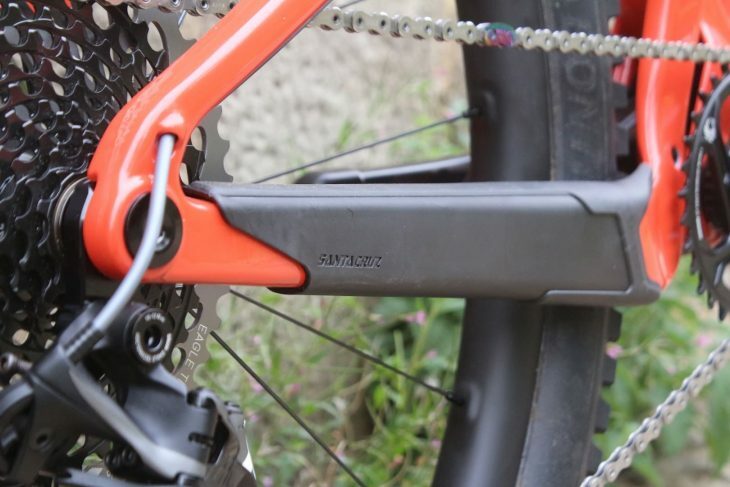 Hidden inside the steerer tube is a Specialized SWAT tool. While more of an accessory than a crucial part of the build, this new SWAT tool from Specialized is worth a mention since it is just so cute! Designed to sit inside the hollow chamber of your fork’s steerer tube, the CC tool stands for ‘Conceal Carry’, and it offers you the ability to port along a wee little multi-tool, a chain breaker and spare links in an area of your bike that’s otherwise unused. 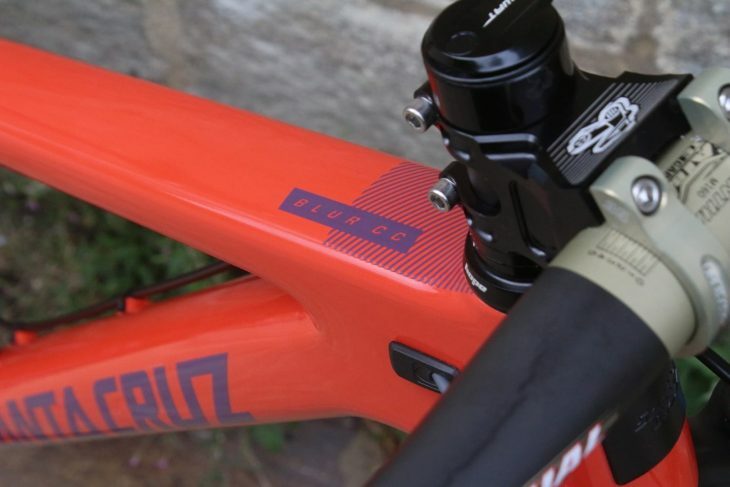 Previously only found on complete Specialized bikes, the CC tool is now available aftermarket, and it fits inside most tapered fork steerer tubes. The SWAT CC tool should fit most alloy tapered fork steerer tubes. You will need to bust out the star nut if there’s one already inside your fork steerer tube, or in my case, leave it out in the first place. To preload your headset bearings, the SWAT CC tool uses a threaded rod that extends down to the bottom of the steerer tube, where it meets an alloy plug that locks onto the end of the tube. A 5mm hex key is all you need to tighten up the headset. 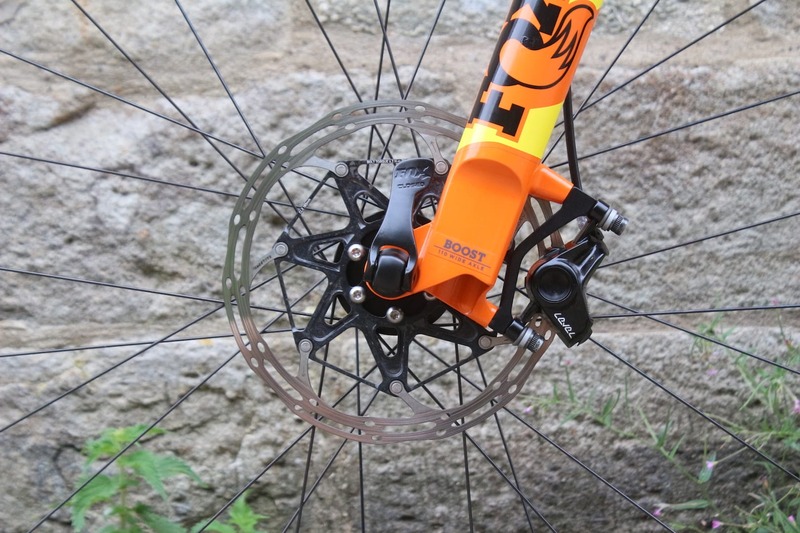 Our test bike has a set of SRAM Level Ultimate disc brakes that we’ve tested previously. 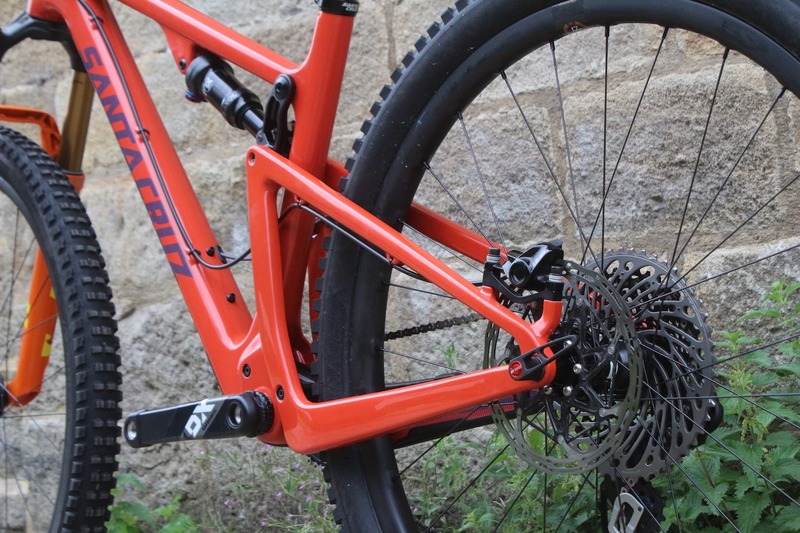 We’ve tested the SRAM Level Ultimate disc brakes before (read the review here), and that test set has made its way onto the Blur as a nice match for the X01 drivetrain. Using a lightweight carbon fibre lever blade, the Level Ultimate is the lightest disc brake that SRAM makes, coming in at just 434g for both brakes, without rotors or adapters. The two-piston callipers have been matched with 180mm Centreline rotors, which ups the available braking power over smaller 160mm rotors. I’ve gone for 180mm rotors front and rear. Tidy post-mount brake tabs on top of a Boost 148x12mm thru-axle. 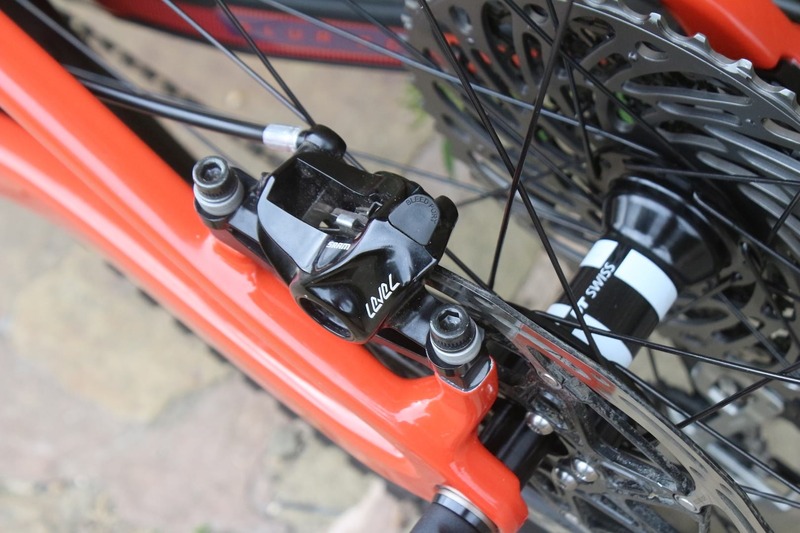 The Level Ultimate brakes have a fantastic lever feel and are also very lightweight too. Routing for the rear brake is all external on the Blur. Thankfully. 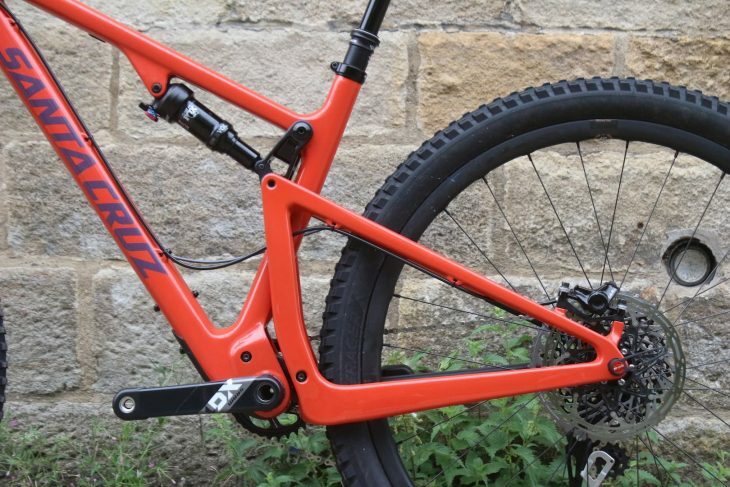 The Blur features a one-piece carbon swingarm that articulates on two alloy linkages. Earlier Blurs had the lower link anchored just behind the BB shell. The new linkage now tucks in above and forward of the BB shell. There’s a Fox Float DPS Performance Series shock on our test frame, which gets the all-black treatment. It’s a remote lockout version, but I haven’t as of yet cabled it up to the remote. There’s loads of standover clearance from the straight top tube. 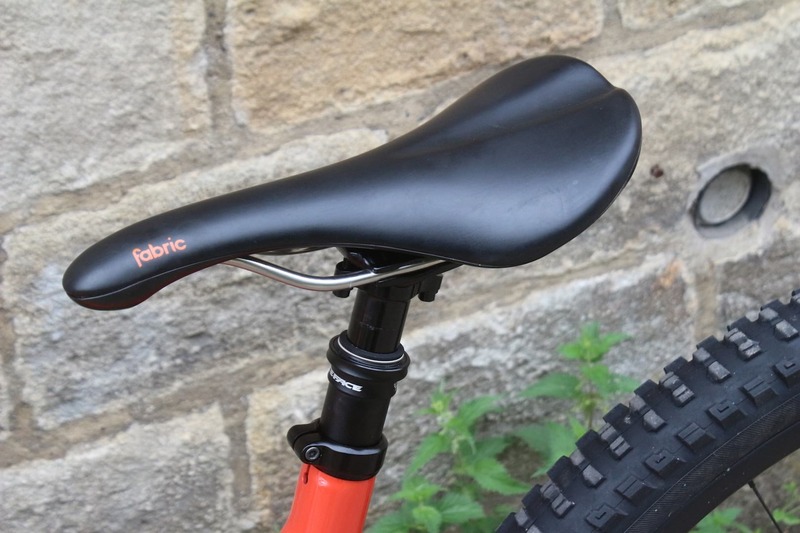 Fabric’s popular Scoop saddle in the Race version with the Radius profile. I had a spare Fabric Scoop saddle in the parts bin that went onto the bike, and with that neat orange logo, it turned out to be quite a nice match for the Blur frame. This is the ‘Race’ version of the Scoop saddle, so it comes with lighter titanium rails and weighs in at 221g. The Scoop comes in three profiles: Flat, Shallow & Radius, with the latter being the curviest of the three, and best suited to a more upright riding position. I battled it out with the internal cable routing, but eventually got the foam tubes inside the frame. 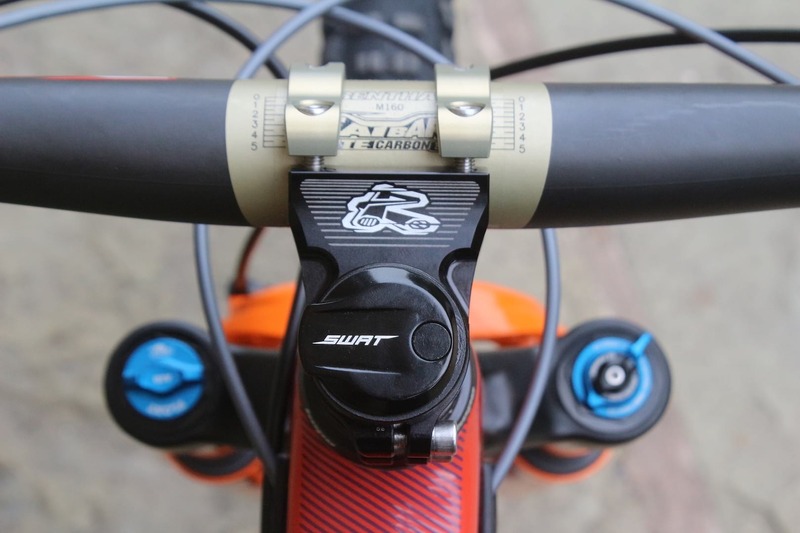 To keep the weight down, the new Blur frame features an integrated headset. The carbon fibre is moulded with the bearing seat directly into its structure, and drop-in bearings simply press into place by hand. The integrated setup keeps the front end low, and it gives the Blur a really clean look. Hope sent us one of its “Pick ‘n’ Mix” headsets, which allows you to specify both the top and bottom headset assembly depending on what your frame requires. 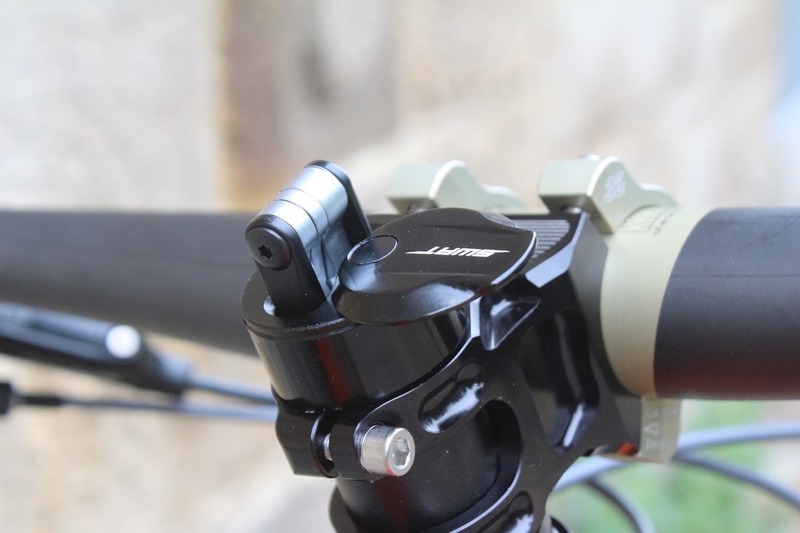 Being a Hope headset, there’s a split crown race to make installation nice and easy. 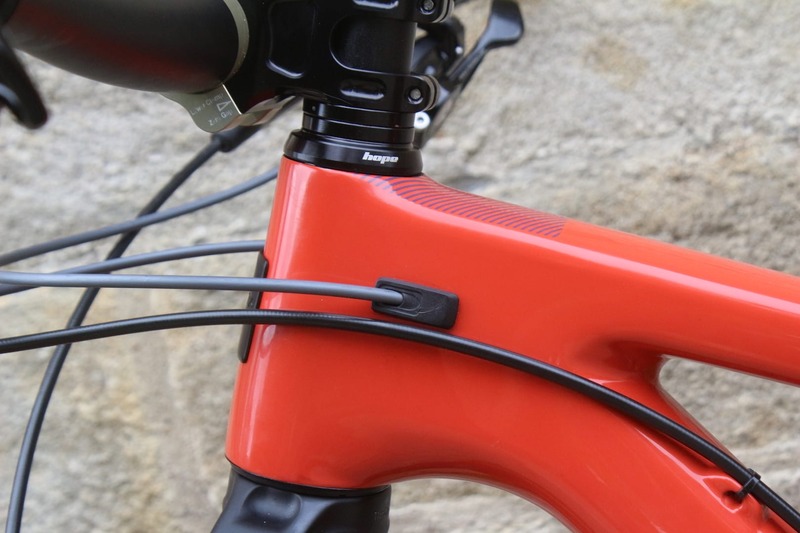 Inside the downtube is a foam tube that wraps around the gear cable housing, and the dropper post cable. These are to deaden noise from the cables bouncing around. Belly armour underneath the downtube and bottom bracket. And a large, moulded chainstay protector. A good looking bike no? And there we have it – the finished product! So, what do you guys think of this particular Blur we’ve built up? Would you have built one differently to this? And is there anything that you’d be keen for us to test on this bike while we have it as a longtermer? Let us know in the comments section below! And the total cost was? ……. 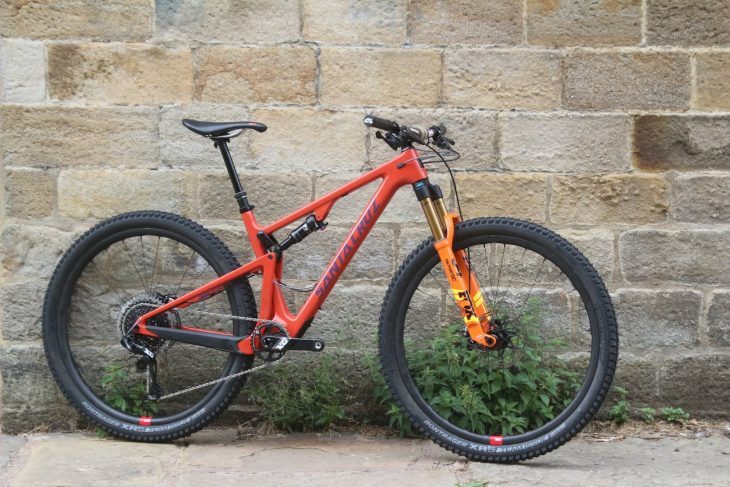 Love the bike, but damn, that fork and frame colour combo isn’t a good one…! Almost my same Blur build with differences being stem (ENVE 70), bar (ENV Riser 760), dropper (Fox Transfer 125), Wheels (Ibis w/I9 hubs), and Crank (Next SL). My color preference is the matte black which I like against the Kashima fork and shock. I wanted a light weight XC bike that could do more. I’ll be curious to read your long term review. When is the full review coming out / short travel shoot out. I also thought the frame was 4.5 pounds. You state 5.5 which is not that light !